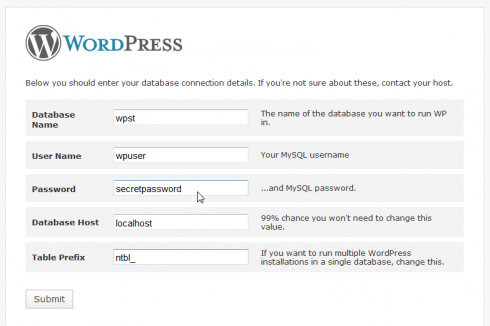 Installing a WordPress website is not hard, but you need to be aware of a few steps to take to make it a secure installation. We will be looking at how to do a WordPress installation, and at what point you need to move away from the standard that WordPress suggests. You could use the much-promoted Fantastico Script on your hosting (aff) cpanel, but I have found that the process described below gives you more flexibility and control. Your own domain hosting package (this is where your installation will take place). The information from your database (name/username/password). Once you have that in place, it’s time to start your installation. Notice I did not use https://www.wpsitebuilding.com? 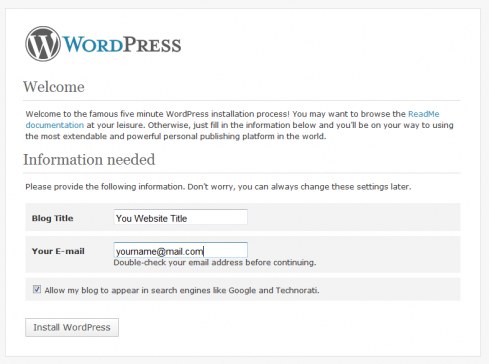 WordPress, after the installation, will redirect that www to the non-www version automatically. If you want www in front of your domain, start your installation with the www and the non-www will be redirected to the preferred domain URL. Change the default values t0 the settings you were given or created for accessing the database you want to use for installation. On the last field labled “Table Prefix” you will notice the standard wp_. Change that value! Make it something different than wp_. Most hacker scripts will target the table called wp_users and/or wp_options, bij. Changing the prefix will prevent you from being targeted with those basic attacks. Of course, the values in this screen are not from a live site. If the data you entered in the previous step is correct, you should see a screen that tells you that you can run the install. If not, you will get an error and then need to recheck if you entered the connection data correctly. 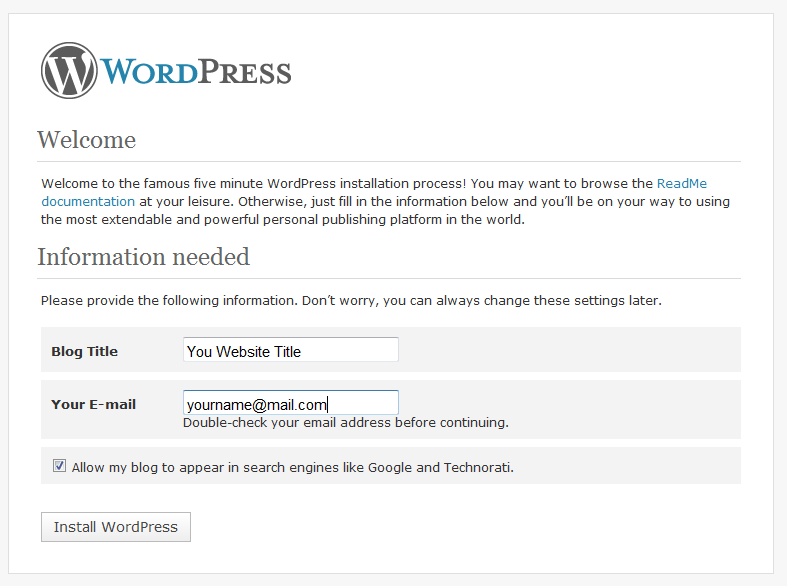 In the finishing screen, you need to write the name of your blog and fill in your e-mail address. This e-mail address is to send you a message with your username and password, so make sure it is a valid e-mail address! 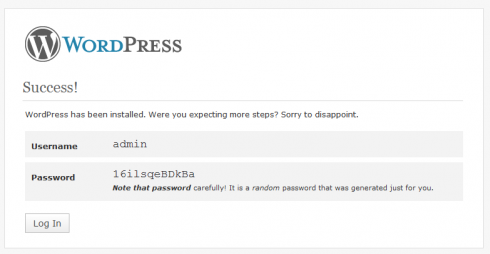 You will get an admin password assigned in the next step. Succes! Your installation is done! If everything ran well during the installation process, you will get a screen with the user name “admin” and a system generated password. 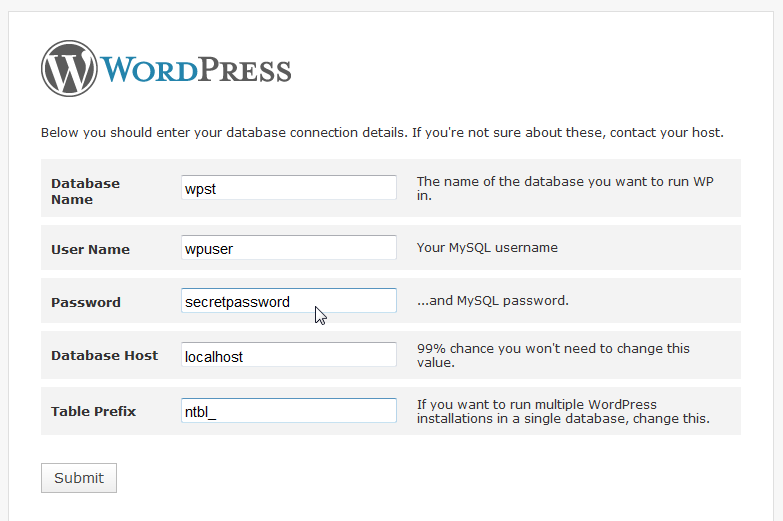 Copy and paste that password into a text editor like Notepad so you can use it to login to your fresh WordPress installation. Once your installation is done, you can click the “Log In” button on the previous screen, but you will only see this screen once. 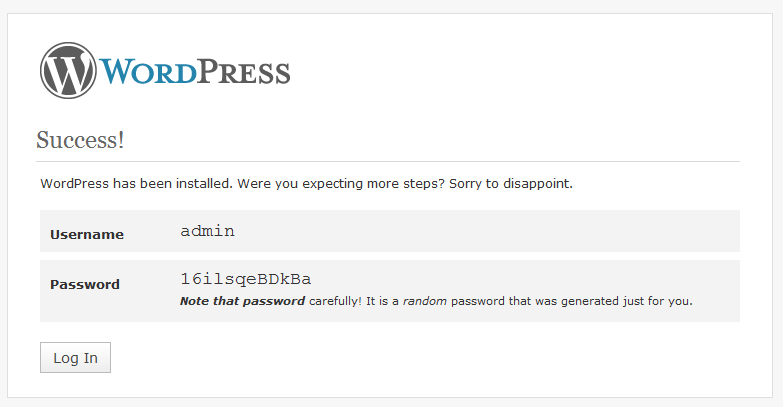 /wp-admin or /wp-login.php (for example, http://example.com/wp-admin). 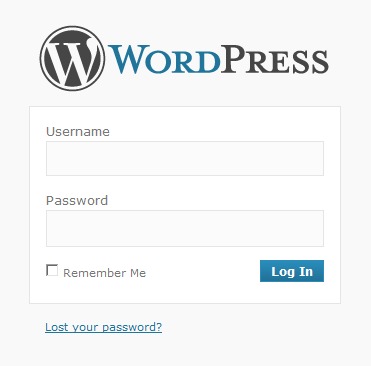 You should then get the login screen for WordPress. Once you are logged in you can start to explore your dashboard and all of the options WordPress gives you to start using and extending your basic WordPress installation. Now where to go from here? 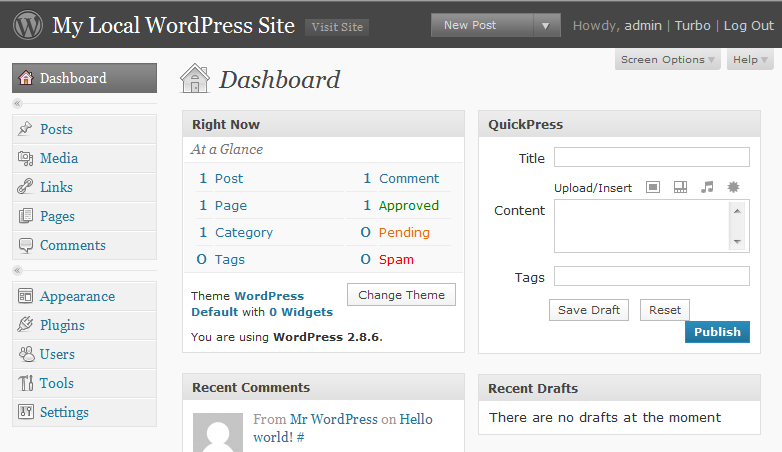 Start with WordPress Setup to make sure to get all the options in the settings and more setup the right way. Below is a video that shows you what steps to take for getting WordPress, setting up your database and using FTP to upload the WordPress software. The installation process in this video is different because it starts with the creating and editing of the configuration file. New Articles right into your inbox, sign up for free now! 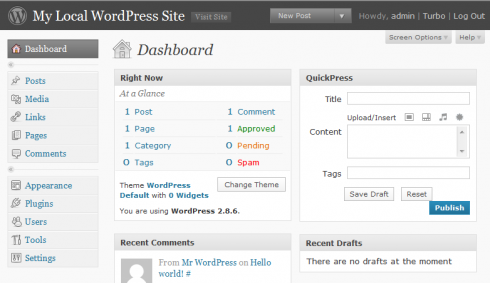 Start Your Own WordPress Site! 1. 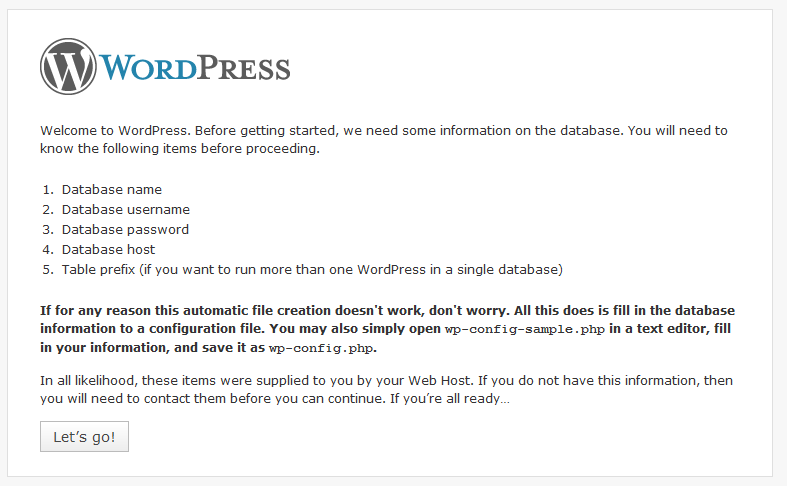 Get Website Hosting.from HostGator.com and use their easy WordPress installation script. P.S. This site is build on Metro by StudioPress.